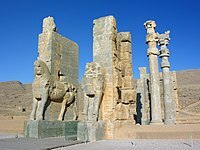 The Parthian Empire ( /ˈpɑːrθiən/ ; 247 BC – 224 AD), also known as the Arsacid Empire ( /ˈɑːrsəsɪd/ ),  was a major Iranian political and cultural power in ancient Iran. Its latter name comes from Arsaces I of Parthia  who, as leader of the Parni tribe, founded it in the mid-3rd century BC when he conquered the region of Parthia  in Iran's northeast, then a satrapy (province) under Andragoras, in rebellion against the Seleucid Empire. Mithridates I of Parthia (r. c. 171–138 BC) greatly expanded the empire by seizing Media and Mesopotamia from the Seleucids. At its height, the Parthian Empire stretched from the northern reaches of the Euphrates, in what is now central-eastern Turkey, to eastern Iran. The empire, located on the Silk Road trade route between the Roman Empire in the Mediterranean Basin and the Han dynasty of China, became a center of trade and commerce. The Parni or Aparni were an East Iranian people who lived around Ochus (Tejen) River, southeast of the Caspian Sea but it is believed that their original homeland may have been southern Russia from where they emigrated with other Scythian tribes. The Parni were one of the three tribes of the Dahae confederacy. The culture of Iran, also known as culture of Persia, is one of the oldest in the world. Owing to its dominant geo-political position and culture in the world, Iran has directly influenced cultures and peoples as far away as Italy, Macedonia, and Greece to the West, Russia to the North, the Arabian Peninsula to the South, and South and East Asia to the East. Thus an eclectic cultural elasticity has been said to be one of the key defining characteristics of the Persian spirit and a clue to its historical longevity. Furthermore, Iran's culture has manifested itself in several facets throughout the history of Iran as well as the Caucasus, Central Asia, Anatolia, and Mesopotamia. The Kingdom of Armenia, also the Kingdom of Greater Armenia, or simply Greater Armenia, sometimes referred to as the Armenian Empire, was a monarchy in the Ancient Near East which existed from 321 BC to 428 AD. 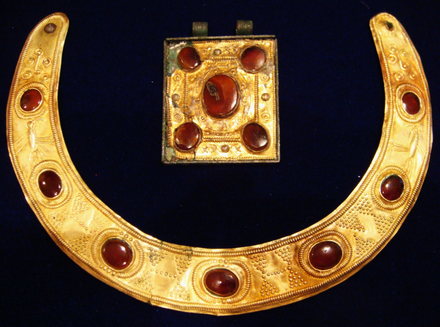 Its history is divided into successive reigns by three royal dynasties: Orontid, Artaxiad and Arsacid (52–428). Native Parthian sources, written in Parthian, Greek and other languages, are scarce when compared to Sassanid and even earlier Achaemenid sources. Aside from scattered cuneiform tablets, fragmentary ostraca, rock inscriptions, drachma coins, and the chance survival of some parchment documents, much of Parthian history is only known through external sources. These include mainly Greek and Roman histories, but also Chinese histories, prompted by the Han Chinese desire to form alliances against the Xiongnu. 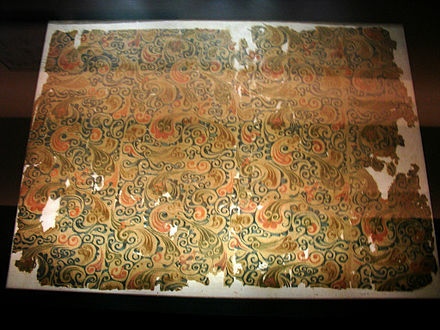 Parthian artwork is viewed by historians as a valid source for understanding aspects of society and culture that are otherwise absent in textual sources. 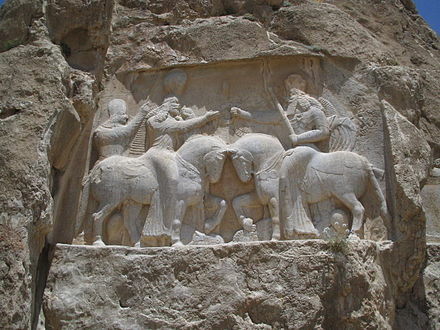 The Parthian language, also known as Arsacid Pahlavi and Pahlawānīg, is a now-extinct ancient Northwestern Iranian language spoken in Parthia, a region of northeastern ancient Iran. 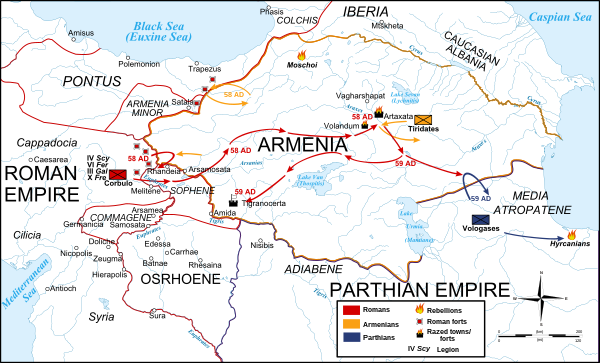 Parthian was the language of state of the Arsacid Parthian Empire, as well as of its eponymous branches of the Arsacid dynasty of Armenia, Arsacid dynasty of Iberia, and the Arsacid dynasty of Caucasian Albania. Koine Greek, also known as Alexandrian dialect, common Attic, Hellenistic or Biblical Greek, was the common supra-regional form of Greek spoken and written during the Hellenistic period, the Roman Empire, and the early Byzantine Empire, or late antiquity. It evolved from the spread of Greek following the conquests of Alexander the Great in the fourth century BC, and served as the lingua franca of much of the Mediterranean region and the Middle East during the following centuries. It was based mainly on Attic and related Ionic speech forms, with various admixtures brought about through dialect levelling with other varieties. 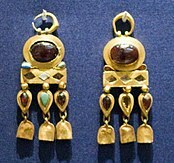 The Dahae, also known as the Daae, Dahas or Dahaeans were a Scythian people of ancient Central Asia. A confederation of three tribes – the Parni, Xanthii and Pissuri – the Dahae lived in an area now comprising much of modern Turkmenistan. The area has consequently been known as Dahestan, Dahistan and Dihistan. Why the Arsacid court retroactively chose 247 BC as the first year of the Arsacid era is uncertain. A.D.H. Bivar concludes that this was the year the Seleucids lost control of Parthia to Andragoras, the appointed satrap who rebelled against them. Hence, Arsaces I "backdated his regnal years" to the moment when Seleucid control over Parthia ceased. However, Vesta Sarkhosh Curtis asserts that this was simply the year Arsaces was made chief of the Parni tribe. Homa Katouzian  and Gene Ralph Garthwaite  claim it was the year Arsaces conquered Parthia and expelled the Seleucid authorities, yet Curtis  and Maria Brosius  state that Andragoras was not overthrown by the Arsacids until 238 BC. Adrian David Hugh Bivar was an Emeritus Professor of Iranian Studies at the School of Oriental and African Studies, University of London. As a numismatist and archaeologist, he specialized in Sasanian seals and rock reliefs, Kushano-Sasanian coins and chronology, Mithraic iconography, Arsacid history and pre-Islamic folklore. His written works include book chapters written for Fischer Weltgeschichte(vol.16, 1966) and The Cambridge History of Iran (1983). Upon assuming the throne, Phraates IV eliminated rival claimants by killing and exiling his own brothers. One of them, Monaeses, fled to Antony and convinced him to invade Parthia. Antony defeated Parthia's Judaean ally Antigonus in 37 BC, installing Herod as a client king in his place. Antony attempted to strike an alliance with Artavasdes I of Media Atropatene, whose relations with Phraates IV had recently soured. This was abandoned when Antony and his forces withdrew from Armenia in 33 BC; they escaped a Parthian invasion while Antony's rival Octavian attacked his forces to the west. Following Antony's suicide in Egypt followed by that of his wife Cleopatra in 30 BC,  the Parthian ally Artaxias II reassumed the throne of Armenia. As culturally and religiously tolerant as the Parthians were, they adopted Greek as their official language, while Aramaic remained the lingua franca in the empire. The native Parthian language, Middle Persian, and Akkadian were also used. 1 2 Fattah, Hala Mundhir (2009). A Brief History Of Iraq. Infobase Publishing. p. 46. ISBN 978-0-8160-5767-2. 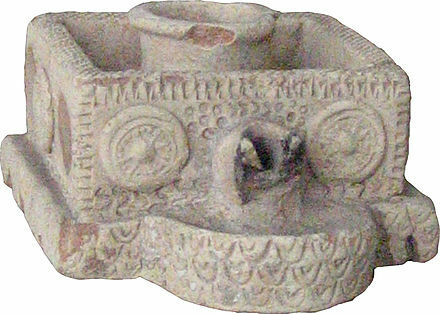 One characteristic of the Parthians that the kings themselves maintained was their nomadic urge. 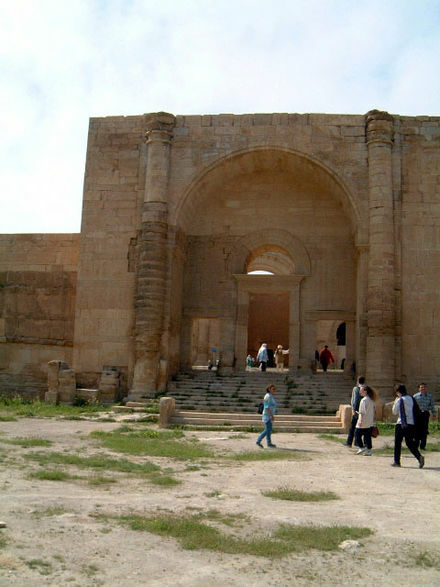 The kings built or occupied numerous cities as their capitals, the most important being Ctesiphon on the Tigris River, which they built from the ancient town of Opis. ↑ Skjaervo, Prods Oktor. "IRAN vi. IRANIAN LANGUAGES AND SCRIPTS (2) Doc – Encyclopaedia Iranica". www.iranicaonline.org. Encyclopedia Iranica. Retrieved 8 February 2017. Parthian. This was the local language of the area east of the Caspian Sea and official language of the Parthian state (see ARSACIDS) and is known from inscriptions on stone and metal, including coins and seals, and from large archives of potsherd labels on wine jars from the Parthian capital of Nisa, as well as from the Manichean texts. ↑ Taagepera, Rein (1979). "Size and Duration of Empires: Growth-Decline Curves, 600 B.C. to 600 A.D.". Social Science History. 3 (3/4): 121. doi:10.2307/1170959. JSTOR 1170959. ↑ From Greek ἈρσάκηςArsakēs, from Parthian ୀ୓୔୊Aršak. ↑ Waters 1974 , p. 424. ↑ "roughly western Khurasan" Bickerman 1983 , p. 6. ↑ Daryaee 2012, p. 179. ↑ Bivar 1983 , p. 47; Cassius Dio writes that Lucius Afranius reoccupied the region without confronting the Parthian army, whereas Plutarch asserts that Afranius drove him out by military means. ↑ Bivar 1983 , pp. 48–49; also, Brosius 2006 , pp. 94–95 mentions this in passing. ↑ Kennedy 1996 , p. 80 asserts that permanent occupation was the obvious goal of the Parthians, especially after the cities of Roman Syria and even the Roman garrisons submitted to the Parthians and joined their cause. ↑ Bivar 1983 , pp. 60–63; Garthwaite 2005 , p. 80; Curtis 2007 , p. 13; see also Kennedy 1996 , p. 81 for analysis on Rome's shift of attention away from Syria to the Upper Euphrates, starting with Antony. ↑ See Brosius 2006 , pp. 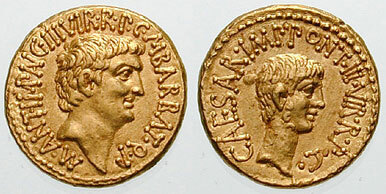 137–138 for more information on Roman coins depicting Parthians returning the lost military standards to Rome. ↑ Dr. Aaron Ralby (2013). "Emperor Trajan, 98—117: Greatest Extent of Rome". Atlas of Military History. Parragon. p. 239. ISBN 978-1-4723-0963-1. 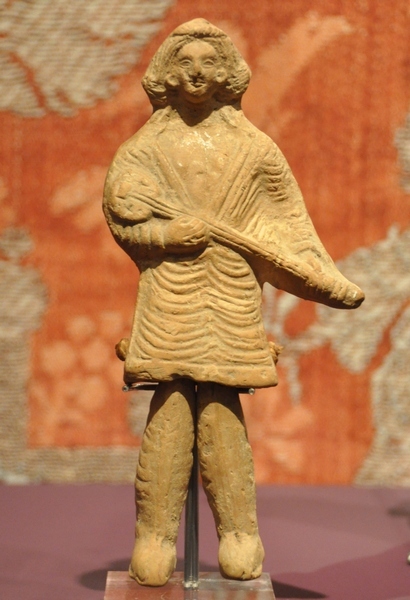 ↑ Kurz 1983 , p. 564; see also Brosius 2006 , p. 138 for further analysis: "Curiously, at the same time as the Parthian was depicted as uncivilised, he was also 'orientalised' in traditional fashion, being described as luxury-loving, leading an effeminate lifestyle, and demonstrating excessive sexuality." ↑ "Strabo, Geography, Book 11, chapter 9, section 3". www.perseus.tufts.edu. Retrieved 2017-09-11. Mithridates II was king of Parthian Empire from 124 to 88 BC. He was already known as "the Great" in antiquity. He is the first Parthian ruler to regularly use the title of "King of Kings", thus stressing the Parthian association with the Achaemenid Empire. Considered one of the most prominent monarchs of the ancient East, his reign marked the rise of the Parthians as a superpower. He spent most of reign consolidating his rule in the Near East, successfully re-conquering Babylonia, and turning the kingdoms of Armenia, Adiabene, Characene, Gordyene, and Osrhoene into vassal states. He also captured Dura-Europos in Syria, and restored Parthian authority in Sakastan, which was given as a fief to the House of Suren. During the last years of his reign, however, his empire fell into disarray, with the Parthian nobility having enough authority to challenge the Parthian king periodically, including a rival-monarch named Gotarzes I, who claimed the throne. Following Mithridates II's death in 88 BC, Gotarzes ruled Babylonia, while Orodes I ruled the eastern territories of the empire separately. Hyrcania is a historical region composed of the land south-east of the Caspian Sea in modern-day Iran, bound in the south by the Alborz mountain range and the Kopet Dag in the east. Mithridates I, also known as Mithridates I the Great, was king of the Parthian Empire from 171 BC to 132 BC. During his reign, Parthia was transformed from a small kingdom into a major political power in the Ancient East as a result of his conquests. He was the first Parthian king to assume the ancient Achaemenid title of King of Kings. Due to his accomplishments, he has been compared to Cyrus the Great, the founder of the Achaemenid Empire. Mithridates I died in 132 BC, and was succeeded by his son Phraates II. 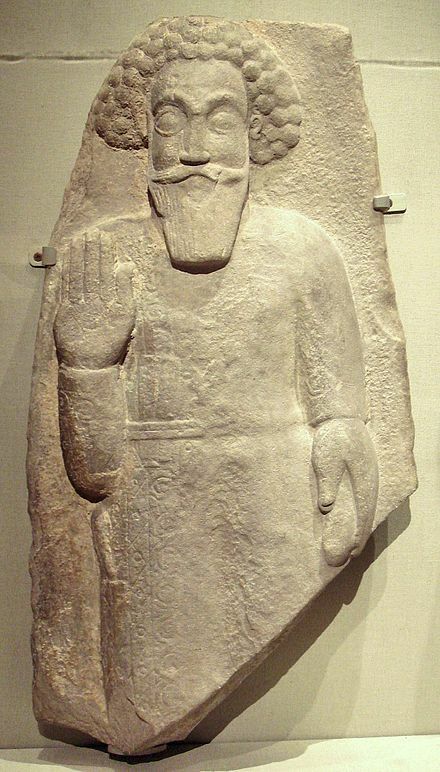 Phraates II was king of the Parthian Empire from 132 BC to 127 BC. He is mostly known for his attempt to reconquer Babylon. He was the son of Mithridates I. Because he was still very young when he came to the throne, his mother Ri-'nu initially ruled on his behalf. Phraates I of Parthia was ruler of the Parthian Empire from ca. 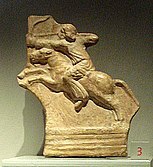 176–171 BC. He subdued the Amardians, mountaineers occupying the eastern portion of the Elburz range, south of the Caspian Sea. He died relatively young, and appointed as his successor not one of his sons, but his brother Mithridates I.
Phraates V known by the diminutive Phraataces, ruled the Parthian Empire from 2 BC to AD 4. He was the younger son of Phraates IV of Parthia and Musa of Parthia, with whom he is associated on his coins. Under Phraates V a war threatened to break out with Rome about the supremacy in Armenia and Media. 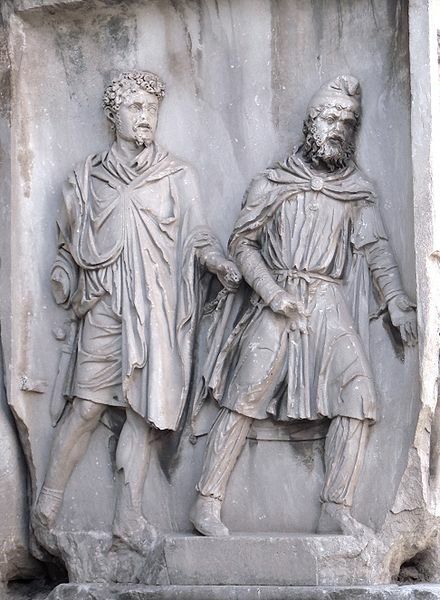 But when Augustus sent his adopted son Gaius Caesar into the east in order to invade Iran, the Parthians preferred to conclude a treaty, by which once again Armenia was recognized as in the Roman sphere. Soon afterwards Phraates V and his mother were slain by the Parthians, sometime around AD 4. Josephus alleges that Phraates V married his mother Musa, and, this being unacceptable to the Parthians, they rose up and overthrew him, offering the crown to Orodes III of Parthia. Orodes II of Parthia, was the king of the Parthian Empire from 57 BC to 37 BC. Orodes was a son of Phraates III, whom he murdered in 57 BC, assisted by his brother Mithridates. He married a Greek Princess from the Kingdom of Commagene, called Laodice who was a daughter of King Antiochus I Theos of Commagene and Queen Isias Philostorgos of Commagene. Artabanus I, incorrectly known in older scholarship as Artabanus II, was king of the Parthian Empire, ruling briefly from c. 127 to 124/3 BC. 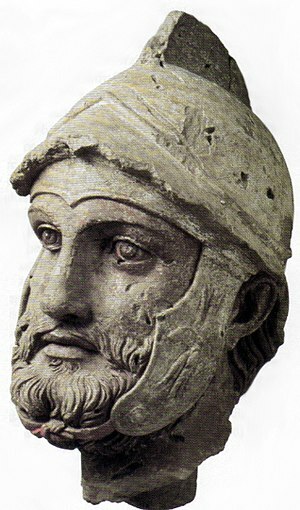 Pacorus II was king of the Parthian Empire from 78 to 105. Arsaces II, was the Arsacid king of Parthia from 217 BC to 191 BC. Phriapatius or Priapatius, sometimes called Phriapites, was the king of the Parthian Empire from 191 BC to 176 BC. He was the son of a nephew of Arsaces I, the founder of the Parthian Empire. Andragoras was an Iranian satrap of the Seleucid provinces of Parthia and Hyrcania under the Seleucid rulers Antiochus I Soter and Antiochus II Theos. He later revolted against his overlords, ruling independently from 245 BC till his death. 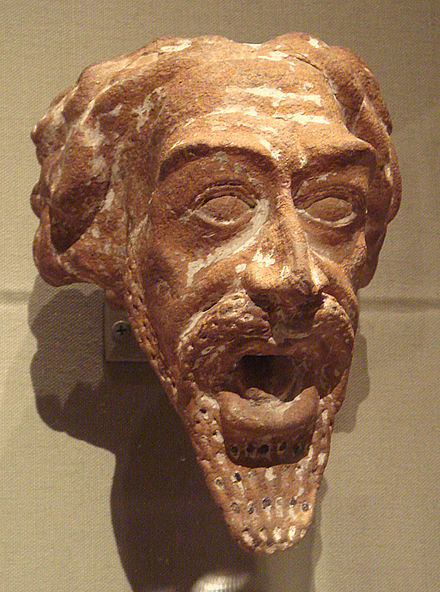 Rustaham Suren, better simply known as Surena or Suren was a Parthian spahbed during the 1st century BC. He was the leader of the House of Suren and was best known for defeating the Romans in the Battle of Carrhae. Under his command Parthians decisively defeated a numerically superior Roman invasion force under the command of Marcus Licinius Crassus. It is commonly seen as one of the earliest and most important battles between the Roman and Parthian empires and one of the most crushing defeats in Roman history. 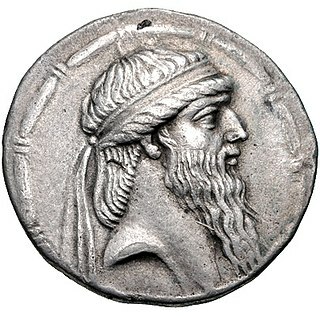 In 245 BC, Andragoras, the Seleucid governor (satrap) of Parthia proclaimed independence from the Seleucids, when - following the death of Antiochus II - Ptolemy III seized control of the Seleucid capital at Antioch, and "so left the future of the Seleucid dynasty for a moment in question." Frye, R.N. (1983), "The Political History of Iran Under the Sasanians", in Yarshater, Ehsan, Cambridge History of Iran, 3 (1), London & New York: Cambridge University Press, pp. 116–180, ISBN 978-0-521-20092-9 . Wikimedia Commons has media related to Parthia .